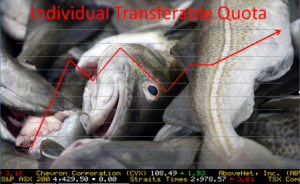 ITQ is an abbreviation for Individual Transferable Quota (image credit: Iceland Magazine). An ITQ is an Individual Transferable Quota. It is part of a quota system in which the managing agency divides up catch shares of the Total Allowable Catch (TAC) for the fishing season. This essentially, creates a “stock market” like system for the fishery where ITQs can be bought and sold. Setting up this type of management system is often contentious because some consider this process a privatization of public resources and others are concerned about the equity of the initial ITQ allocations. Generally, the starting ITQs are based on recent records from the fishery, such as boat ownership or prior catch. Once the system is in place, ITQs can be rented, bought, or sold. While ITQs are considered effective in preventing “tragedy of the commons” collapses of fish stocks and have been credited with helping restore some fish populations, the approach remains controversial in some fisheries due to concerns with consolidation of ownership through market-based approaches. 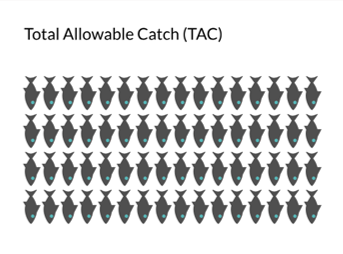 TAC is an abbreviation for Total Allowable Catch (image credit: mimiculture.com; icon design: Scott de Jonge from Flatiron). TAC is Total Allowable Catch. This is the upper limit in the amount of fish, either by weight or number, that a fishery is allocated in a given season or year. 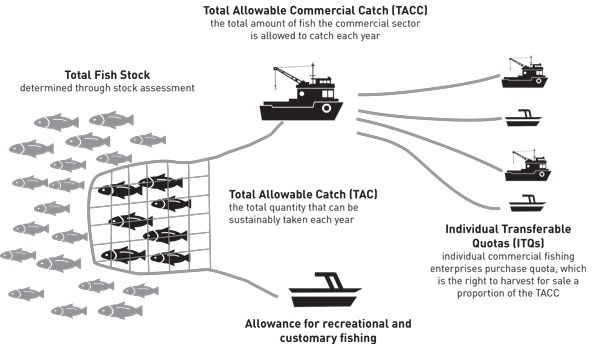 TACs can apply to the targeted fish and/or bycatch, where once the limit is reached the fishery is closed for the remainder of the applicable time frame. Often, the TAC is set based on an assessment of the stock status for the fishery, such as maximum sustainable yield (MSY). In open-access or “derby” style fisheries, there is a free-for-all competition until the TAC is exhausted. This can lead to risky or unsafe behavior, where vessels may continue to operate in hazardous conditions in order to harvest a larger proportion of the TAC. In order to avoid accidents from such situations, some fisheries have opted for quota-based management systems where the TAC can be divided into catch shares, such as Individual Transferable Quotas (ITQs). A quota is the allowable number or amount of fish that can be harvested in a commercial or recreational fishery. This is a regulatory strategy to limit harvest. They are set each fishing season based on allowance for sustainable harvest (e.g., see Maximum Sustainable Yield). In certain commercial fisheries, quotas are essentially equivalent to a “share” in a fish stock. 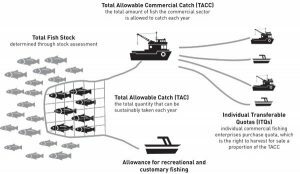 These Individual Transferable Quotas (ITQs) can be bought and sold and entitle the owner to a given proportion of the Total Allowable Catch (TAC) for a fishing season. 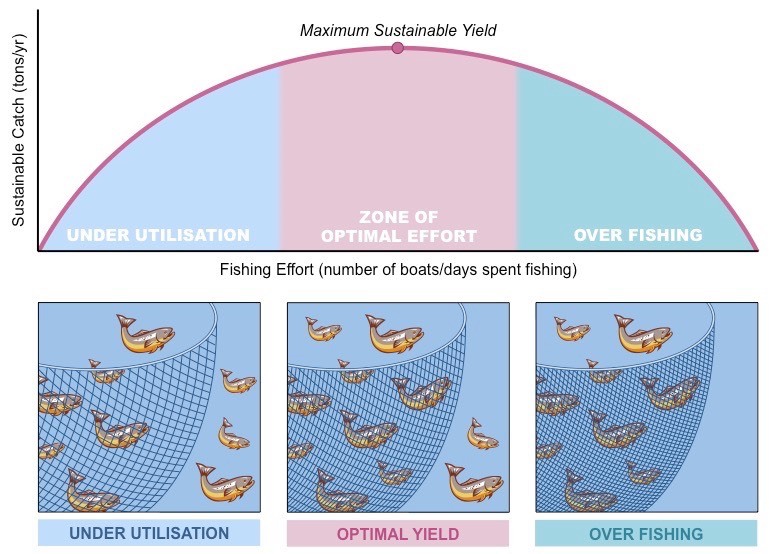 Optimizing fishing effort (Diagram credit: http://ib.bioninja.com.au). 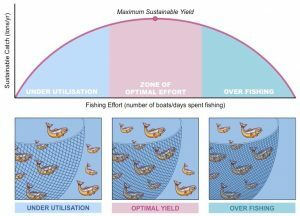 Maximum sustainable yield (MSY) is a classic concept from fish population dynamics. It operates under the assumption that populations have a carrying capacity, or equilibrium size, where the the resources available match the population requirements and if individuals are removed from the population, they will be replaced (i.e., are renewable). When harvest removes a portion of the population, it lowers pressures on the population’s associated resources, such as food and habitat, allowing the remainder of the population to benefit from less competition and balance the population back to the carrying capacity. By this theory, the surplus biomass can be harvested sustainably, without long-term impacts to the population. MSY is a commonly applied fisheries management tool, and even a guiding principle of the Magnuson-Stevens Fishery Conservation and Management Act, the primary legislation governing marine fisheries management in United States federal waters. However, it is important to note that there are many situations in which the assumptions of MSY are not met which result in overfishing and unsustainable practices.